Pakistan Army Monday expressed its resolve for continued support to all the institutions for ensuring the writ of the state and rule of law. “Forum expressed its resolve for continued support to all state institutions for ensuring writ of the state and rule of law in which lies the peace, stability and prosperity of the country,” a statement issued by the Inter-Services Public Relations (ISPR) after the 215th Corps Commanders Conference read. 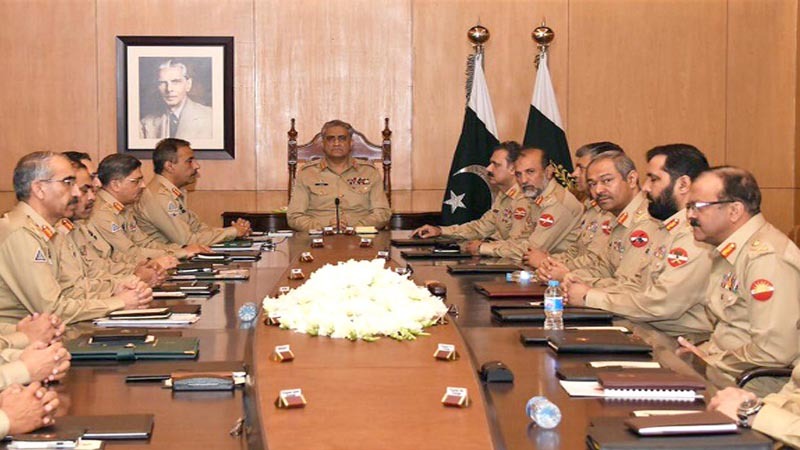 The conference, presided over by Chief of Army Staff (COAS) General Qamar Javed Bajwa, reviewed geo-strategic environment and security situation of the country. Progress on ongoing operations, fencing along Pak-Afghan border, situation along the eastern border including Indian ceasefire violations and deliberate targeting of innocent citizens were also discussed during the meeting held at the GHQ in Rawalpindi, according to ISPR.